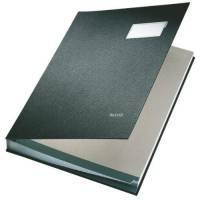 Leitz Hard Cover Signature Book 240x340mm Black 57000095 Pack of 1 Leitz Signature Book Black W240 x D28 x H340mm 57000095. 90% recycled material. Hard board covers with polypropylene foil coating for water resistance. 20 dividers with textured surface, bottom tabs and viewing window. Front label holder.